The martial arts of medieval, renaissance, and early modern Europe include sophisticated and well-documented systems of grappling. The art of wrestling was an absolutely essential skill for any fighter and could be applied for sport or in earnest defense of one’s life, in armor or everyday clothing, with empty hands or while employing weapons. Our training approach is to start class with vigorous partner drills that build and reinforce the fundamentals of standing wrestling. These ‘building block’ exercises, or very similar ones, are used across the spectrum of grappling arts from jiu-jitsu to freestyle wrestling. The core skills honed by these exercises include balance, timing, advantages and disadvantages of various grips and holds, and the ability to feel your opponent’s intent. Developing these fundamental skills allows us to learn from the historical fighting manuals by helping to unlock the underlying concepts of the techniques, which ultimately allows us to practice them in a more spontaneous and competitive way. Ott Jud, Fiore dei Liberi , Fabian von Auerswald, as well as the Codex Wallerstein. 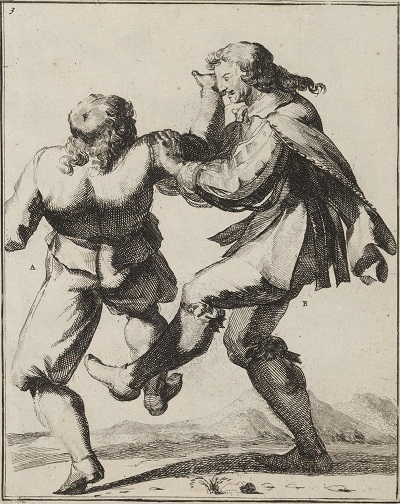 Some of these fighting manuals deal exclusively with unarmed wrestling, while others present grappling as a critical component of fighting that is also employed while using a weapon such as a sword or dagger. 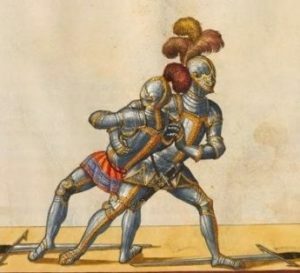 Armored wrestling from the Gladitoria manuscript. Some members who attend our practices have a background in grappling arts such as Judo, Brazilian Jiu Jitsu, freestyle wrestling, or extensive experience with historical European fighting systems. Others are relatively new to martial arts, or have no prior experience. Beginners with a positive attitude, respect for safety, and a good work ethic are welcome! 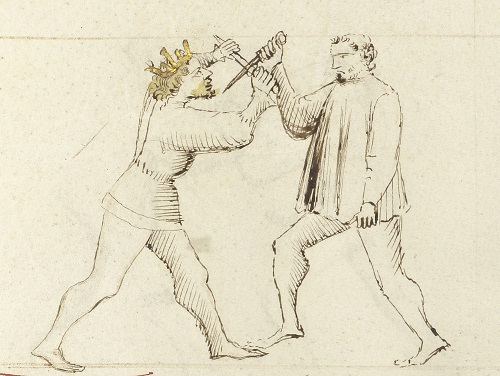 The use of and defense against the dagger in medieval and renaissance martial arts is closely related to the unarmed wrestling techniques taught in those traditions. We draw from a variety of historical fighting manuals for guidance and to develop our dagger curriculum. We strive towards a balanced approach to training that emphasizes the development of strong fundamental fighting skills while maintaining respect for the historical context of this challenging and rewarding martial art. Safety is always a top priority at our practices. We use dagger simulators that are appropriate for the level of intensity for the chosen activity. We use high-quality head, neck, and torso protection as each situation requires. We train on most Saturdays from approximately 12:30 PM to 2:00 PM. We are a small and less formally structured practice group. We occasionally need to yield the space for special events, or postpone practice due to personal scheduling conflicts. Please check the #closequarters_hema channel if you are a member of the Lonin Slack community to make sure that practice is on. You can also email me directly if you have any questions about what we do, or would like to come in and try training with us.